The embryos of the African clawed frog, Xenopus laevis, have the been a favorite tool of classical embryologists for over 100 years. Xenopus has been useful in the study of vertebrate development because the embryos are large, easily manipulated and develop externally, allowing analysis at very early, highly conserved stages of development. Therefore, embryos can be subjected to microsurgical manipulation to remove or transplant embryonic tissues, or injected to knockdown or express large quantities of a transcription factor. Such experiments have provided information on the inductive contacts required for pattern formation and have defined many of the molecular interactions involved in early development. The acorn worm Saccoglossus kowalevskii burrows in the sand and is collected from a bay near Woods Hole, MA. This female has spawned eggs after a brief heat treatment. The goal of the Silva lab is to define the gene network that controls the induction and patterning of the central nervous system. The CNS is derived from the ectoderm which can develop into either epidermal or neural tissue (see below). The neural tissue can then differentiate into either neurons or glial cells. Many of the signal pathways and transcription factors involved in directing these fate choices are known however, the exact molecular mechanism is unknown. To elucidate this mechanism, our studies focus on the regulation of the SoxB genes which encode highly conserved, HMG box transcription factors involved in the formation of CNS. 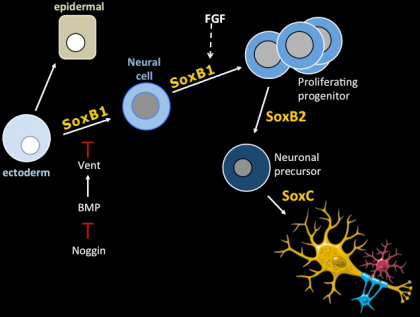 By studying the regulation of the SoxB genes and the function of proteins, we can piece together the steps that drive ectoderm to develop into epidermis and neural tissue to form a neuron. 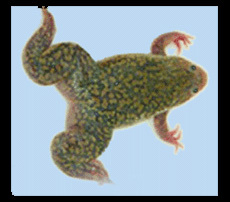 Presently we are interested in studying neural induction and differentiation in the frog Xenopus and conserved regulatory themes by studying these processes in the hemichordate S. kowalevskii. By using both organisms, we can investigate the evolutionary conservation of the regulation and function of the Sox proteins. 1. Defining the Regulation and function of SoxB genes which encode transcription factors involved in neural stem cell maintenance, competence and differentiation in Xenopus laevis. 2. Identifying the signaling pathways involved in the Induction and patterning of the nervous system in S. kowalevskii.